I've wanted a long strand of Baroque pearls ever since I spied some on my honeymoon 20 years ago. We visited Broome in Western Australia for part of that time, and the pearls there were astoundingly beautiful. My husband had gifted me a more traditional strand of pearls as a wedding gift, seen here (as requested in my last post about hats here). But they to me, are not an everyday kind of pearl. The more modern Baroque ones, above, appeal to me as something I could wear constantly. Late last year, I stopped frittering my money away on a bit of a sale purchase here, and an op shop purchase there to supplement my wardrobe, and stopped to really take stock. I decided I wanted to transition from my Upmarket Mummy wardrobe, which has served me well admittedly, to something more elegant and chic. Which brought me to Marie-Anne Lecouer and her French Chic Academy. I pondered for a day or two, and finally decided that at my age (57), it was time to invest in myself. And not via retail therapy. I signed up for Marie-Annes course, opting for the monthly payments, calculating that it was no more than I traditionally spent on fabric, patterns, accessories, and so on, and finding that I was really no better off. From the first day, Marie-Anne changed my thinking. All of those principles that I applied to other areas of my life, suddenly made sense in terms of personal presentation too. Why have a wardrobe of clothing to choose from, when a few classic separates, in quality fabrics will serve equally? Why have row upon row of earrings, and necklaces and other accessories, when a quality watch (which I already have), some pearls, and diamond or pearl studs, will suit any occasion admirably? Why have dozens of pairs of shoes (guilty...you too? ), when a quality pair of wedges, and one pair of ballet flats will suit any occasion? I immediately ceased spending indiscriminately. Don't get me wrong, I was always budget conscious. But I often didn't give a lot of thought beyond things being the right colour, usually black, and fitting me. A bonus. Dressing the Petite Plus Sized Apple shape is a trial, I tell you. Instead, that money went towards my course with Marie-Anne. I also stopped buying other trivial things, like sushi for my daughters afternoon tea. An insignificant purchase and only once or twice a week, but even that adds up. Instead I transferred that money to my Mad Money account, while I followed Marie-Annes advice on decluttering my wardrobe and making a list of what I needed, including an in depth description. Which is where these pearls came in. I remembered how much the deep lustre and blue violet sheen of those pearls on my honeymoon captured me, and how often I'd wished I could afford some. I wrote down in my journal, a description of my ideal strand of pearls. 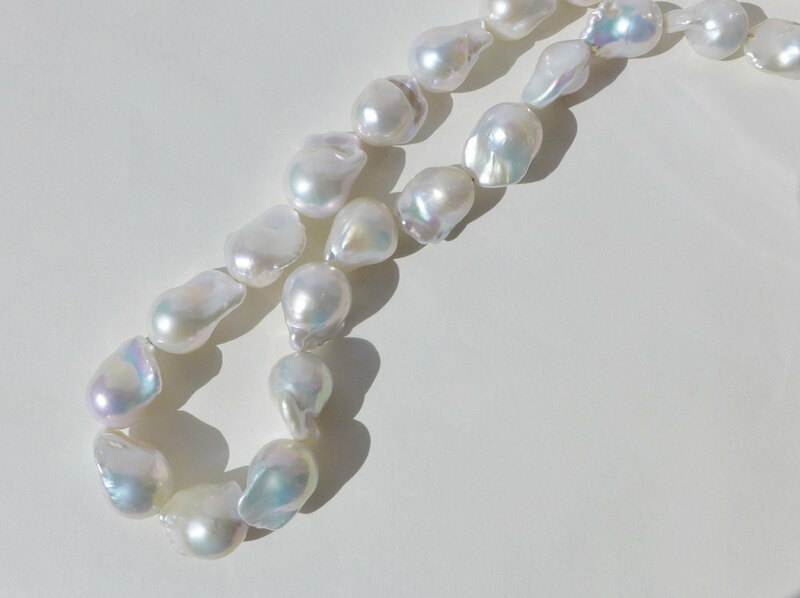 They had to be large, even oversized, a particular shape of Baroque pearl, a particular length of strand, and a very particular colour. I dreamed for a bit. Then, suddenly, I had that money. $5 here, and $7 there adds up, as many of you probably know. I went looking and found a dealer on Etsy, who could custom make the very pearls I wanted all my life, for a price within my budget. The pearls I'd noted down in my journal. These pearls are pictured at the top of my post. They're yet to be knotted and strung, but these are my pearls. 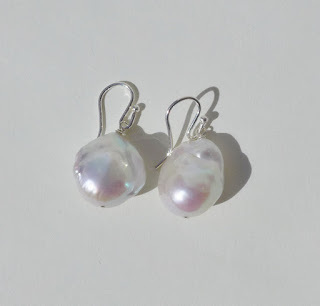 A bonus is that there are pearls left over from the lengths she purchased for me, and she has made these earrings as a bonus for no extra charge. If you'd like some gorgeous pearls, look no further than Laura at JaguarJems on Etsy. She's a darling and couldn't do enough for me. Such lovely pearls, Mimi. They will look just right on you I think. I knew you must have been a beautiful bride considering how lovely you are today. The proof is in the picture. Thank you for sharing. A beautiful bride and beautiful pearls. I hope wearing the pearls will bring you many year's of joy and happiness. Sometimes things are worth waiting for. It would be nice to see a picture of you wearing them. Congrats on working hard toward your goal. So fun to hear how you discovered to pare down and concentrate on quality. Inspiring post. I'm so glad you are getting the pearls of your dreams. Thanks for sharing at Monday Social. Stop by on Sunday to find yourself featured.